Dr. Milabel E. Ho, Vice President for Research, Extension and Development and concurrent Vice President for Academic Affairs inspires the crowd of future educators. Western Mindanao State University-Research Utilization Publication and Information Dissemination (RUPID) pursued the 2nd College of Education (CED) Research Forum last July 20. 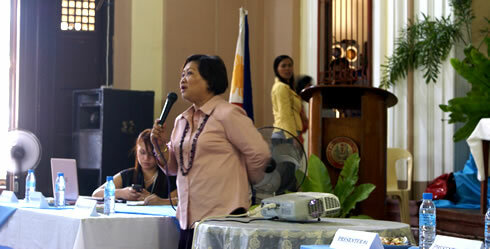 The forum was held at the CED Social Hall. Participated by the CED’s very own students and faculty members, the forum provided a venue for the presentation and discussion of research in the field of education. The event featured mainly the learning, updates and innovation of the researches of its faculty members. Almost a couple of years now, RUPID has always been committed in bringing together students and faculty members alike to discuss their finished researches. Headed by its Director- Dr. Julieta B. Tendero, RUPID set its focus to promote the improvement of research and evaluation in any encompassing field. It also fosters professional collaboration among similar agencies which also promote research and conduct researches. Among the researchers presented were Factors Influencing Innovative Team Building Decision-Making and Job Performance of Secondary Principal and Teachers in Sulu by Dr. Sheryll O. Mendoza; Teaching Performance and Competencies of the WMSU CED Graduates With and Without Field Study by Dr. Mely Jane D.S. Jacinto; Communication Strategies in Second Language Learning of College Freshmen Students in Western Mindanao State University by Ms. Raissa M. Ponce, Fritzgerald Keys and Apple Tree Language Approaches: Their Effects on the English Achievement Level and Retention Level of the Hearing Impaired Pupils by Ms. Iana Rene L. Circulado; Perceptions of Public Secondary Students toward English and Filipino as Media of Instruction Vis-à-vis their Academic Achievement Level in Social Studies by Mr. Joel C. Macanisag; Autoenthographic Research in Education by Ms. Berhana I. Flores; Factors that Influence the Staff of WMSU CED Computer Use in the Classroom by Mr. Eric Roland Natividad; and lastly, The Role of Play in Teaching Literacy in Contemporary Early Childhood Context in the Philippines by Ms. Jervil Formilleza-Omaga. An open forum followed after each presentation.